The purpose of this blog is to give an inside look into the search for Natalee Holloway, offshore Aruba, Dec-2007. All writings are from a geophysical engineer and marine geologist on board the search vessel R/V Persistence. All quotes are direct quotes. All information in this site is reviewed for content and accuracy. This site will be updated daily until the search is terminated. With the sonar search completed, the RV Persistence sets sail heading to its home port in Louisiana. With mixed emotions, the search team returns home. When we arrived in Aruba in mid-December we were mentally prepared to return home either having found Natalee, or after having exhausted all possibilities in the quest to find her. It is difficult going home with many questions left unanswered and so many sonar targets remaining to be explored. Our comfort lies in knowledge that we have done the best job we could, that we can return to dive on the remaining targets when funded, and that answers may come in time. We feel that the search is not over but rather entering a new phase. We are thankful for the outpouring of generosity, love, support, and prayers throughout the entire search effort. Since the 16th of December, off the west coast of Aruba the search team on board the RV Persistence has been combing the sea floor of an area 80% the size of Aruba. The Herculean side scan sonar search is complete. With a complete picture of entire search area's seabed, a final ROV dive target list will be constructed. This list is expected to well-exceed 100 targets. The timing and extent of the remaining ROV dive operations depends on weather, logistics, and funding. The team is weary, yet filled with a sense of accomplishment. The team has performed very well even under the intense pressure, difficult terrain, rough seas, and often grueling pace. Over the past several days, the Persistence has been working with the help of the Aruban police in shallow water. The Police safely escorted boaters out of the area allowing the Persistence to work and maneuver freely. The Persistence is working in shallow waters today. Working in shallow waters is in one sense a relief compared to the deep water areas. The shallower water is protected by the island both in terms of wind and currents. As a result, the area is serene and beautiful. On the other hand, the shallow water area contains its own set of hazards. Closer to shore, passing boats, coral, and underwater obstructions increase the risk of damaging equipment. The decision to not immediately re-arrest Joran van der Sloot has not affected the resolve of the search team. Despite the poor weather, survey operations continue. Over the past few days, progress in the deep water areas has been hampered by 14ft seas and 30kt+ wind. The conditions are simply too rough to work safely. Today, the Persistence headed out to the survey area, completed a single line, and headed back to the dock after getting pounded in the rough conditions. The dedicated ocean search for Natalee Holloway has been underway since mid-November, 2007. What began in Louisiana during mobilization now culminating in Aruba, the search has utilized some of the best search equipment and personnel in the world. To date, approximately 900 miles of sonar data has been collected covering a geographic area 80% the size of Aruba. The search has required a painstakingly slow approach which in the end leaves no stone unturned. Although slow, this approach is extremely effective in marine search and recovery. Since the beginning, the search has been privately funded by Louis Schaefer Jr. of Underwater Expeditions who remarkably and gracefully accepted the financial burden when requested by Texas Equusearch and Natalee's parents. John Silvetti of Marine Surveys, Greg Landry of Offshore Innovative Solutions, Erik McGuire of Seatronics, along with Agiosat and Wilkens Weather Service came beside Louis to conduct this humanitarian effort. To put this search effort in financial perspective, an equivalent search conducted for industry would involve costs well exceeding several million dollars. This project has been conducted for about 35 cents on the dollar, with costs still exceeding a million dollars. Although we have searched and ruled out an extensive portion of the original planned search area, a substantial portion of the high-probability area yet remains to be explored. Now, following a publicly confirmed admission that Natalee Holloway was disposed at sea, we are confident that completing the focused search area will bring closure. We therefore formally invite and request anyone who this humanitarian effort has touched to get involved and to help support the remaining search efforts. Donations are being handled by Texas Equusearch, a 501 (c) (3) nonprofit organization. Please come beside those who have already given so much to help ensure a proper funeral in Alabama for Natalee Holloway. Please make all donations marked as: "Holloway search". The weather over the past few days has been steadily prohibitive to work. Each day, the Persistence has left the dock, headed offshore, and gotten pounded by 40kt winds and 10-14ft seas. The rough weather has taken a toll on both the equipment and the crew. The towfish was damaged twice during recovery, each time taking half a day or more to repair. While the poor weather persists, the Persistence will undergo some needed maintenance. Today we are working on the winch and air conditioning. Hopefully tomorrow will be calmer. Over the past couple nights, the world tuned in along with the search team and watched the mottled confessions of Joran van der Sloot. The confessions filled the search team with resolve, renewing our assurance that if Natalee Holloway can be found in the ocean we will find her. Yesterday (Tues, 04-Feb), the Persistence was in the deepest portion of the survey area battling 12-14ft with occasional 16ft seas with 35kt winds. The weather built rapidly, spawning a squall and water spout. Today, we returned to deep water encountering 40kt+ winds and heavier seas than yesterday. A simple task such as taking a shower or walking down a corridor takes gymnastic talent. These seas are too rough to safely work in, let alone function inside the boat. On account of the conditions, we moved to shallow quiescent waters and resumed the search. The Persistence search team and crew are very excited about the recent developments announced yesterday, Thursday January 31st. We are currently acquiring data and have not stopped or changed our search methods in response to the announcement. We too wait with anticipation and hope the outcome is both positive and accurate for the remainder of the ongoing investigation. Our hearts and prayers are with the Holloway and Twitty families. The Office of the Public Prosecutor of Aruba has intensified its investigation of the case of Natalee Holloway due to recently received information. This information may shed a new light on the mode of which Natalee Holloway has died and the method by which her body disappeared. The Public Prosecutor has lately received this information from the Dutch crime reporter Peter R. de Vries. This information may help considerably in the solution of the mystery of Natalee’s disappearance. In cooperation with the Aruban Police Corps, the Office is currently investigating the reliability and value of this new information. It will be evaluated in relation to the results of the preceding profound research activities. The Aruban Police Corps has continued the investigation of the case despite the formal discontinuation of the prosecution of the suspects of the day, in December 2007. Commissioned investigators are currently charged with further inquiries. In the interest of the ongoing investigation no further information will be circulated. Nota bene: the Office of Public Prosecutor will not give any interviews about the matter at hand at this moment, not by telephone, neither on camera. The last several days saw outstanding progress in what was expected to be the roughest part of the search area. Last night, we learned why the local fishermen nicknamed this area “don’t go there”. The seas were a rather innocuous 2-3ft with pleasant 10kt breeze. Within an hour, the seas exploded into a 12-14ft torrent with 35kt sustained winds. After a few hours battling side seas the search team brought the sonar on deck amidst crashing waves of green water pouring over the back deck. We found an approximately 265ft long wreck lying upright on the seabed which is an eerie testament of this area’s volatile ferocity. The Persistence left the dock this morning at 0740 hrs. The 15kt winds out of the east lapped up rather tranquil 2-3ft seas. It's as calm as we've ever seen it offshore here. The Aruba Coast Guard boarded the Persistence for a friendly visit at 0810 hrs this morning. For an hour we shared coffee, traded T-shirts, swapped stories, and showed them our progress. They were extremely impressed by the side scan sonar capabilities and 3-D bathymetric imagery. After a round of hearty hand shakes and a few good pictures, they boarded their approximately 30ft long rigid-hull inflatable boat and pushed off from the Persistence. With a smile they shouted to us, “Would you like a little demonstration?” At once, the Coast Guard took off with a sudden blast from two massive inboard engines. In no time the nimble boat was leaping wave to wave at nearly 40kts. Several times the boat came clear out of the water. It was thrilling not only to watch the playful demonstration, but to watch the trust build and friendships form. Working with the Aruba police dive division, Coast Guard, and Port Authority has been an astonishing experience. Since December 15th we've established a solid working relationship based on openness and trust. Most of the successful rapport was due to getting the media hype out of the way and working together shoulder to shoulder through time. We've helped each other however and whenever we can. They've treated us with decency and respect and we have treated them as friends and allies, which they are. I wish we had a month ahead of the project just to ascertain the relationships and bonds. Although highly skeptical and suspecting in the beginning, it's clear we're all carefully and diligently working towards a common goal. It seems we share the same attitudes of integrity, courage, dedication, and hope. We’ve all struck an accord in the desire for closure and healing for the families involved and restoring the relationship between our beloved countries. The miracle she referred to was whether we believed we would find Natalee Holloway based on the relative odds and unknowns. The question I returned was perhaps more poignant. How would our lives be changed in the process of finding her in light of the adversity and unknowns? I maintain my position that it is a much larger miracle to have lives and hearts changed than to overcome odds and solve unknowns. Since the beginning of this search I have been witness to many miracles. I’ve watched loving wives gracefully supporting their husbands while waiting home alone with children for over a month. I’ve seen sons and daughters patiently and cheerfully waiting for their daddies to come home to them. I’ve seen hearts moved and changed to give generously out of love and conviction. I’ve witnessed trust build, bonds form, friendships established, lies replaced with truth, mistakes forgiven, and perhaps the greatest of all and hardest to fathom... genuine loving sacrifice. While searching offshore Aruba from the shallows to the abyss, we have truly ventured into a new search area. We’ve been exploring the very essence of our human being discovering purpose, hope, strength, and love along the way. The Persistence leaves the dock this morning at 0730 hrs. Working during mainly daylight hours has been a welcome change for the crew and good for moral. The seas and winds have not been as severe lately. The last two days saw excellent progress. 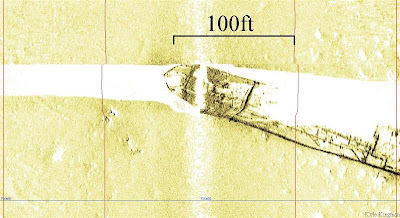 The original search area surveyed by the R/V Persistence was selected based on numerous pieces of information provided by Dave Holloway, Tim Miller, investigations, interrogations, depositions and other information from local authorities. After compiling and reviewing the information, the search area was selected by Louis Schaefer and John Silvetti. 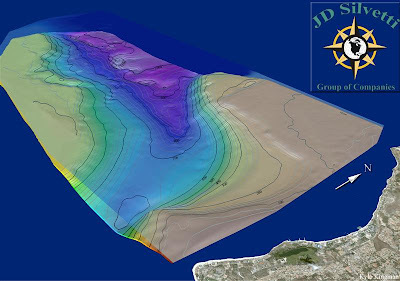 Upon completion of the sonar runs in this area, 65 ROV dives were performed by Offshore Innovative Solutions (OIS) on targets identified by sonar. Divers from the Aruban Police Diving Division and Underwater Expeditions made several dives and retrieved samples which were delivered for analysis. Several targets in this first survey grid yet remain to be investigated by ROV which will occur in approximately one week when ROV dive operations recommence. Selection of the next area, the “Extended Search Area”, was based on one single piece of information, a reported confession by one of the three suspects. This confession, as relayed to the survey team, has some credence. It involves the same type of disposal scenario, but better defines the search area. This information in combination with the weather patterns observed by the survey team since our arrival on December 15th left only one boundary to define. 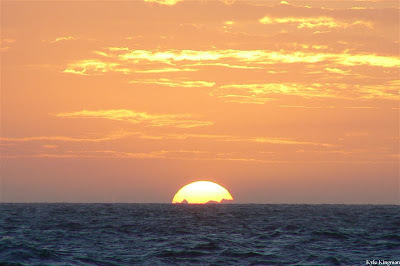 The team needed to observe the island from offshore on a small vessel at night to determine this boundary. Sounds easy….huh? After 2 unsuccessful attempts using a local vessel due to fuel and mechanical problems, the decision was made to utilize the R/V Persistence’s Rescue Boat, the “Avon”. The Avon is a 16’ center console inflatable vessel powered by a 70 hp Tohatsu engine. Prior to dark, the Avon was launched from the Persistence and piloted to the Holiday Inn Pier by Captain Jim Graves. Later that evening, John Silvetti boarded the vessel with Capt. Graves, transited to the start point, and commenced an offshore run documenting the time and vessel position with a WAAS enabled hand-held GPS system. At one mile out, radio communications were confirmed with the Persistence. At six miles out, radio communications were again confirmed along with spot light identification as the Avon crossed astern of the Persistence. It was somewhere shortly after this point that Murphy boarded the Avon! The weather was very similar to the recorded weather of late May, 2005. The seas were running 4-6’ with swells of 6-8’. It was rough for an Avon! Upon reaching the final destination point while documenting the final position, the engine sputtered and stalled. It never started again! Approximately 30 minutes of effort to restart the engine was fruitless. I believe that is when we noticed that we were taking on water! HELLO HOUSTON, WE HAVE A PROBLEM! As we watched Aruba disappear over the horizon, contemplating our broken engine, a vessel taking on water and the fact that we are about to enact the emergency contingencies of our procedures, Capt. Graves stated, “ I am sure glad that it is so dark!” I took the bait. Why? Because I believe we would be scared to death if we could see how big these waves are! Persistence…Persistence….this is Avon on channel 16 ..over! Silence. Persistence…Persistence….this is Avon on channel 16 ..over! Five minutes of silence. Back up frequency. Persistence…Persistence….this is Avon on channel 09 ..over! Five minutes of silence. VHF comms failure. Ya gotta love Murphy. 1) Never use your lower back to absorb the shock of pounding seas when you are fat and out of shape. 2) Never get fat and out of shape. 3) No matter how complete and thorough your safety procedures are, never count Murphy out! The Persistence left the dock at 0700 hrs headed for the survey area. The winch is fixed, skies are clear, and the seas are calmer. The new crew are settled in and getting used the work flow. The Persistence left the dock this morning at 0600 hrs, heading out to deep water. Last night, four replacement survey team members flew in to join the Persistence to relieve crew who has been here since the beginning, over a month ago. Although the new crew brings new energy, losing the battle-proven seasoned crew is bittersweet. Words fail to describe the level of trust and bond between the crew. Despite being in close quarters together since 15-Dec, missing holidays with loved ones, birthdays, anniversaries, rough seas, and many intense situations, NEVER was there a moment of bad tension between any of the crew. I trust the new crew will quickly bond and become seasoned to the terrain and conditions- both above and below the waves. Happy Birthday sis - You're loved and missed. Sun 20-Jan 2055 hrs- seas 8-10ft, wind E 30-35kts, continuing dead-heading sonar lines in 800-1100+ft of water. The Persistence arrived dockside around 4am this morning after a rough night. 1415hrs - The Persistence pulls away from the dock to return to the deep water survey area. A fundamental principle of Murphy’s Law states that if it can go wrong it will go wrong. When it fails, it will do so at the worst possible moment. This is not a result of chance or bad luck, rather the collision of engineering limitations with physics. Increasing the water depth increases the length of cable paid out which in turn increases the strain on the winch due to the armored cable weight and drag. With roughly 0.5lb/ft of cable x 4000 ft of cable deployed = about 1 ton of cable dead weight on the winch. Increasing the speed either by towing faster or by adding swift ocean currents vectored in the opposite direction increases drag and therefore adds more strain on the winch. Large sea swells (10ft+) heaves and pitches the boat which pulls and drops the towfish significantly. Particularly large swells can shock-load the winch. This means there is a sudden added force which is unevenly applied to the winch. 2355 hrs: The towfish is near the sea floor with 3500ft of cable out in about 900ft of water. A large submarine hill is rapidly approaching so we began spooling in cable as fast as the winch allows. Combined with the drag-strain of the cable, current speed, and large swells, the winch reached its engineered limits and failed at the worst possible moment. Unable to retrieve cable, the towfish was about to catastrophically collide with the seafloor. The only option was to significantly increase speed and immediately turn towards deeper water. The quick decision paid off as the towfish skimmed over the hill-face. Having narrowly escaped the immediate danger, the Persistence stayed in the deepest water possible while making gentle turns as the team fixed the broken winch. Just after midnight with 12-14ft swells amidst the emergency and with waves washing over the back deck, the crew feverishly repaired the winch. The stellar teamwork, excellent situational awareness, and quick thinking combined to successfully avoid disaster. Once the towfish was safe on the back deck of the Persistence we headed for the dock, wet, tired, and relieved. The Persistence left the dock at 1530 hrs heading back towards the deepest portion of the survey area. The weather has been continually rough and does not look like it will let up this evening or through tonight. Fortunately, we took on fresh water this morning which acts like additional ballast for the boat, reducing some of the roll. While in about 750-800ft of water we came across another unknown wreck. 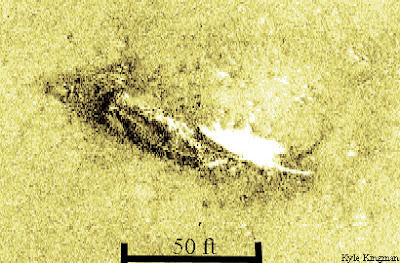 This wreck (perhaps an old schooner) is about 50-55ft long. 1915 hrs - seas building 10-14ft, wind 30+kts. We would like to specifically address one comment left on the blog which likely represents the sentiments of many. “It is easy to lose heart if one confuses expectations with hopes and desires. The nature of a marine search, especially one in which the method and disposition of the item you are searching for is unknown, requires a painstakingly slow and methodical disqualification process. The logic is no different than trying to find your car keys. The methodology is: you look where you were recently. We look where it is believed to be, based on evidence or reports. When you and I do not locate what we are looking for in the most logical place, we move on to the next logical place. Ultimately, we both confirm the old saying, “It is always in the last place you look”. Unknown topography and terrain, combined with large seas have slowed us down but it has not stopped us. We have surveyed and investigated a large area, disqualified most of it, and moved on to an even larger area. At times our progress has been exceedingly fast and slow at other times. We do however, “STAY THE COURSE”....PERSISTENCE. Our hopes and desires also were to find Natalee before Christmas so we could help bring closure to the Holloway family as our gift to them. Then, we could return home to our families to enjoy the holiday season and hug our children a little tighter... but, it was not meant to be that easy...and we understand. The Persistence pulls away from the dock at 1300 hrs heading northwest into deep water. The seas and winds have greatly diminished through the early morning hours. The crew grabs a few hours rest taking full advantage of the calm waters at the dock. 1655 hrs - the seas build to 6-9ft with the occasional 12ft+. Winds 35kts sustained with stronger gusts. 2130hrs - the seas were building steadily all day. We're forced to dead-head lines running acquisition with the seas at our stern. To maintain heading along the line the captain holds a 37-40 degree crab angle due to swift currents and strong winds. The Persistence left the dock today at 1224 hrs. The trade winds are howling at 30+kts. The 8ft+ seas are growing and brimming with white caps rolling in from the northeast. The occasional 12-14ft swell rocks the Persistence mercilessly along with its inhabitants. Inside, life goes on as usual and spirits are high. Exceptionally large swells throw around anything that isn't dogged down. The galley clock gets thrown off the wall and is now stuck reading 8:35. It seems we also have high-tech self-clearing shelves, tables, and counters. Traversing around inside the boat is a novelty in high seas. People turn into walking pendulums making Z-shaped paths leaning to and fro 30 degrees. The comedy is abruptly interupted with a sobering reminder of the ocean's peril over the radio. 2100 hrs - A call comes on the radio from the Aruban Port Authority requesting the Persistence assist a vessel in distress. A sailboat named Michelle with 6 reported on board is adrift. In such strong winds and high seas it's possible the sailboat could have broken its mast. All we know is that they need immediate help. The search team picks up the sonar and immediately heads in the reported direction of the distressed vessel. For miles we scan the dark horizon as Curacao, Aruba, and the Persistence carefully monitor the radio. Finally, we receive a position and plot a bearing and range -4.5 miles, heading 210 degrees. After a while, the Aruban port authority once again raises the Persistence on the radio, only this time with a very different position. It seems not only is the Michelle adrift, she is very lost. I can only imagine what kind of hell the people on board are going through. Powerless, drifting, scared, alone, and at the mercy of perilous seas the Michelle hopes and waits for rescue somewhere offshore Curacao. The Persistence is called off its search and turns towards the Port of Aruba at 2300 hrs. Although unspoken, we all feel a sense of disappointment knowing the Michelle is still out there in danger.